NOTE: This repair was done on my 1994 C280. However since this type of wiper was universal, it should apply to all W202 models. I cannot guarantee 100% accuracy nor can I be liable for any damage one can cause to his or her car or self. 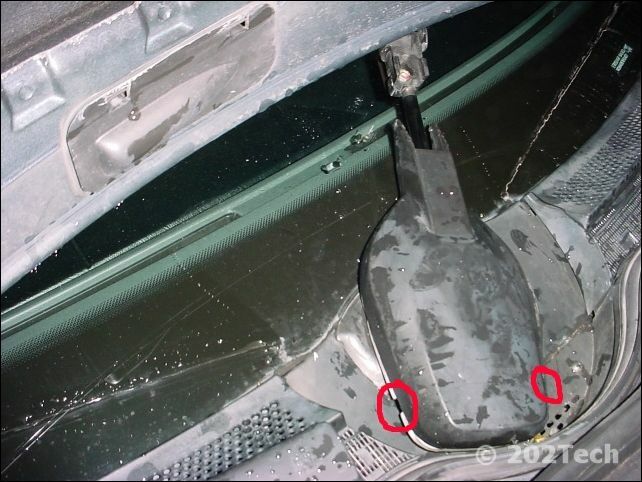 This seems to be a very common problem these days with W202 Mono-Wipers. The symptoms typically include a very slow wiper movement along with hesitation as it reaches certain points on the wiper cycle. This fix essentially lubes the wiper mechanism. It is probably a good idea to do it yearly to keep the wiper moving well all year. Step 1: Set the wiper system to approximately straight up and down on the windshield. This can be achieved by setting the wipers on and turning the igntion key to OFF at the appropriate time. It may take a few tries to get it right. Step 2: Pull off the middle plastic cover by pulling down and out on it (See picture). This reveals a hex screw. 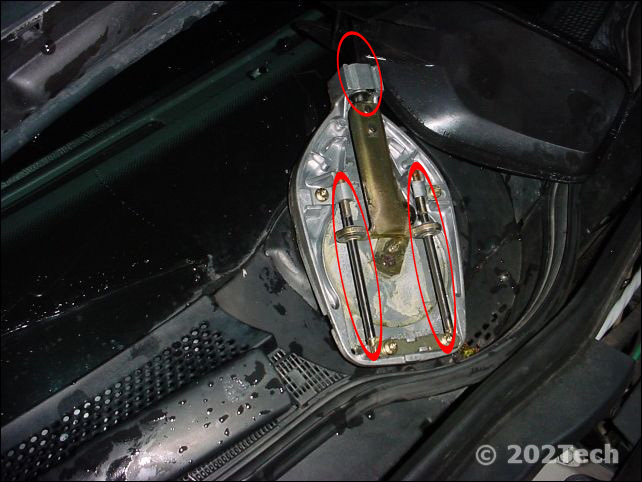 If you wish to remove the entire wiper arm, this can be done by removing the hex bolt. This procedure is not necessary to lube the wiper mechanism. Step 3: Remove the main cover piece by pulling out and up on the two release tabs (circled in the picture) . I used my fingers, but you might need to use something pull the tabs outward and up. Step 4: Before you pull the cover all the way off, set the wiper to approximately 45 degrees so the wiper is at full extension. Make sure everything is clear of the wiper mechanism as it is very powerful! 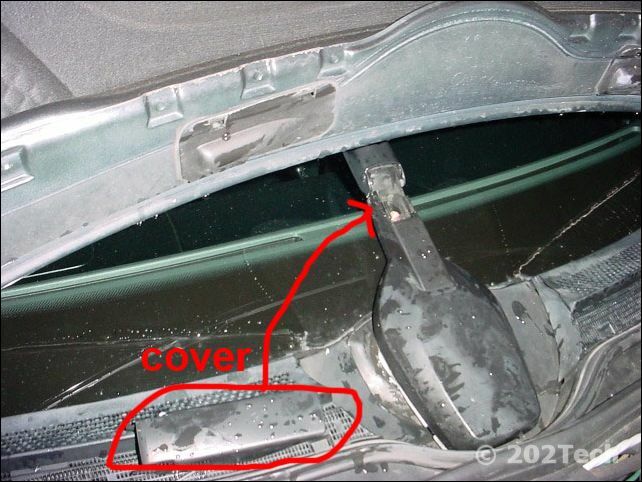 Step 5: Now remove the cover completely and expose the wiper mechanism. I used White Lithium Grease because it is water-proof and it is a spray-on sticky grease. I have had good luck with the grease lasting all year. Make sure when greasing to particularly spray the vertical sliders that keep the wiper linear. Finally, Put everything back together in the order it was removed. Once back together, run the wiper cycle several times to work the grease in. Hopefully it fixed the problem and saved you over $1000!